This is a delightful find—early vintage Maharishi—interviewed by a popular LA television talk show host. Les Crane interviewed Maharishi Mahesh Yogi in September 1967 about a month after The Beatles had met and learned Transcendental Meditation from him. They go over the basics of what Transcendental Meditation is and is not. Maharishi is delightful, laughing and quipping throughout the interview. The one-hour show, minus commercials, is 49:30 minutes long. Les asks Maharishi when he first heard of the Beatles and when they first met him. 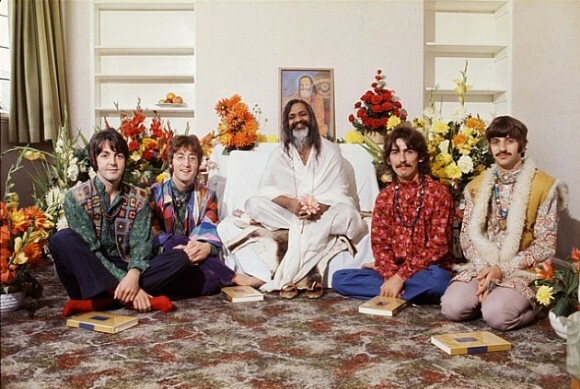 He then quotes the Beatles from the current (Sept 22, 1967) Time magazine cover story, THE BEATLES / Their New Incarnation, where they favorably describe Maharishi and how TM fulfilled their search for a genuine spiritual experience. Les asked some good questions. He was an intelligent man. Halfway into the program Les opens up questions from the audience. He also introduces Efrem Zimbalist Jr. and mentions his association with Maharishi. Les then introduces Jerry Jarvis, national director of SIMS, and asks him to explain the Five Year Plan. Maharishi mentions Charles Lutes and his plan to build an Academy of Meditation in the US. Les asks what the world would look like if many people practiced Transcendental Meditation, and Maharishi gives him a very practical description. See this recent post of The Telegraph reporting on a recent TM study improving graduation rates saying the Beatles may have been on to something after all during their fabled journey to India. Also see Maharishi interviewed on the BBC in 1967. The BBC World Service program Witness, will air an interview with Theresa Olson, Monday March 3, 2014, 8:50 GMT. In the spring of 1959, Indian guru Maharishi Mahesh Yogi set off around the world to spread the teachings of Transcendental Meditation. Witness speaks to Theresa Olson, who was ten years old when the Maharishi came to stay in her parents’ house. A photo is shown of Maharishi taken from BBC1, Sunday July 5, 1964, to promote the upcoming interview on The Maharishi’s World Tour. Another program worth watching from those early days is the 1968 CBC documentary of Maharishi at Lake Louise. The most recent biography on Maharishi aired on A&E’s History Channel, 40 years after the BBC and Les Crane interviews. A new BBC report, on the 50th anniversary of that visit to Bangor to learn more about Transcendental Meditation from Maharishi was published today, August 25, 2017. The Beatles: Historians say 1967 Bangor visit was a turning point. The report includes interviews with people who were there at that time. Maharishi always had an interesting take on world events. In this recently posted 1968 video, he discusses where the worldwide popularity for Transcendental Meditation started. During his visit to England in the summer of 1967, he describes the countrywide concern that was being expressed over the previous 8 months about the deplorable drug problem among the youth. Thanks to Patti Harrison, The Beatles heard Maharishi was going to speak at the London Hilton and got front row seats. They wanted to meet him afterwards and it was arranged. Maharishi inspired them to want to do something good for the youth and they agreed. They wanted to learn how to meditate from Maharishi and he invited them to join him on the long train ride to Wales where he was going to lead a 3-day meditation course. Some reporters overheard their plans. When The Beatles met Maharishi at the train station, they were surrounded by over 50 press and hundreds of fans. The video contains footage from that time as well as photos taken at the lecture and on the train. There is also actual footage taken privately of their discussion, but it has yet to be made public.